No one has noted her resemblance to Dylan. I saw the woodcarver at the park, walking with Mr. Wu and their dogs. They were so far away that when I waved and they didn’t wave back, I figured they just didn’t see me. I walked a little further, then turned to call Django and leash her up. I noticed that the woodcarver seemed to be staring at me, which was silly because they were so far away. But there was something purposeful about his walk. And I had no reason to avoid them, I reasoned. I’d done my homework at last. So instead of leashing Django up I threw the ball in their direction, and she bounded for it. As she neared the two dogs, Django lost interest in the ball. Her run drifted into a walk, and then she just stood, as if she had no idea what she was doing there. 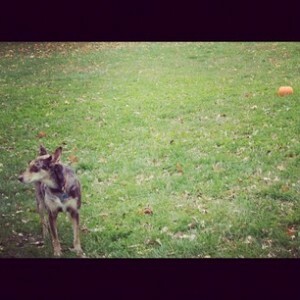 “Get the ball, Django,” I called. She trotted away, in the general direction of the two dogs, while also managing to ignore them completely. I walked back to pick up the ball myself, just as the two men neared. He wasn’t smiling anymore. Suddenly I realized that when I ran into him last week and asked about carvings of dogs, and also asked how long it takes, and come to think of it also asked if there was any chance of getting one by Christmas, and that’s right also said I’d go to his site, that, well, he took me seriously. Suddenly I felt like one of those flakes who do the sort of thing I’d just done. “A shot just like that would be perfect.” Django was standing absolutely still, in profile. She and the woodcarver looked like they expected me to whip out a camera. Mr. Wu said, “That dog has very unusual spots.” He said this like he’d never seen her before, though I’ve run into him at the park at least twice a week for the past six or seven years. At first I’d see him standing alone, dogless, east of the path, examining some detail of a tree. Hands clasped behind him, head slightly cocked, as if some leaf or bit of bark was refusing to be categorized. Then he got a dog and started walking with the woodcarver, or the guy with the unpredictable Golden. “Does she?” I said, which I always say, although I’ve already compared her to photos of African wild dogs online and reached the same conclusion. I said, “I’ll get you the pictures.” The woodcarver looked skeptical, which was understandable. He and Mr. Wu continued walking, and I decided to do another lap in the opposite direction. Can you find the story in this proclamation? Django’s not selling any alibis. Better get those spots checked out. sniff sniff … i feel like my whole life is like the woodcarver’s….